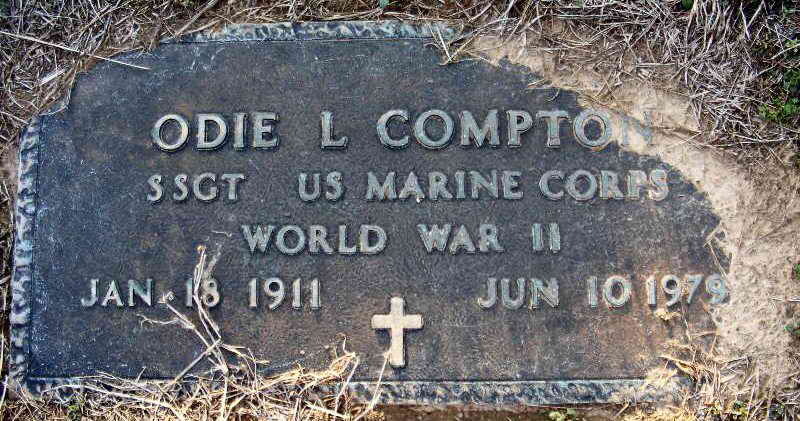 Grave marker for Odie L. Compton in the Hopewell Cemetery, Hanceville (Cullman county), AZ. He was born in Alabama to William K and Emma S Compton. He had 4 siblings named Fannie, Audie, Imogene and Etholin. Odie initially enlisted in the Marines as a Private on 10 April 1935 at the HQ Western Recruiting Office in San Francisco, CA. He was then transferred to the Recruit Depot Detachment in San Diego, perhaps for basic training. In the next 4 years he was stationed aboard the USS Tennessee (battleship damaged at Pearl Harbor), USS Saratoga (aircraft carrier) and the USS Utah (battleship sunk at Pearl Harbor), some on multiple occasions. He had sea duty as far north as Bremerton, WA and south to Panama, Canal Zone and west to Pearl Harbor, Hawaii. His duties were typically as a Gun Striker meaning that he was receiving intensive training for a qualification on a particular weapon. He also had specific training on the USS Utah on the .50 caliber machinegun. Following his stint in the Marines, Odie enlisted in the Army and by 10 August 1944 he was transferred from the 11th Replacement Depot to Company A, 508th PIR where he served as a Light Machinegunner in the 3rd squad..
Pfc Compton received the Bronze Service Arrowhead for his participation in the Holland campaign and Airborne operations and may have participated in the as in the Battle of The Bulge as well..